On the TutsPlus.com site they've posted a tutorial that, making use of the Pusher service, walks you through the process of creating a multi-channel chat application using it, PHP and Vue.js. In this post, I'll show you how to write the functional components of a very simple chat app. It's a stripped-down example, but you'll see how Channels can simplify the implementation of real-time communication in a web app. The Channels functionality makes it simple to subscribe and see only the messages you want (and not everything that comes down the line). The Pusher PHP library makes the integration simple too. The TutsPlus.com site has a new tutorial posted for the Laravel users out there ]introducing you to the framework's broadcast functionality](https://code.tutsplus.com/tutorials/how-laravel-broadcasting-works--cms-30500). Broadcasting in Laravel provides a simple interface to sending notification (such as emails or even real-time push messages) via a standardized interface. Today, we are going to explore the concept of broadcasting in the Laravel web framework. It allows you to send notifications to the client side when something happens on the server side. In this article, we are going to use the third-party Pusher library to send notifications to the client side. If you have ever wanted to send notifications from the server to the client when something happens on a server in Laravel, you're looking for the broadcasting feature. On the Laravel News site there's a new post talking about a new community effort that's been started in the Laravel ecosystem centering around notification channels. A "notification channel" is a method used to interact directly with your users - in this case using Pusher notifications via a simplified interface. Laravel 5.3 will ship with a notification system that includes a Nexmo SMS driver, a Mail driver, and the ability to include custom drivers. Now that we have this system built-in we can use the new Pusher service from inside our Laravel applications. All we need to do is to create a custom driver and that’s it, we’ll be able to send Push notifications to our Mobile devices right away. With the help of Freek Van der Herten and Marcel Pociot we managed to build an easy to use driver for Pusher Push Notifications. The Pusher system not only allows sending messages to you users via the web but also push notifications to mobile devices (iOS and Android). A simple code snippet is included showing the Laravel-centric interface to the functionality and a link to more code examples on a GitHub repository. The post ends with a brief section about creating customer drivers as well. Matt Stauffer has a new post to his site where he's put together an in-depth look at Laravel Echo, a feature included in newer versions of the framework that makes it easy to integrate websockets into your Laravel-based application. A few weeks ago, Taylor Otwell introduced another branded product within the Laravel line: Laravel Echo. So far, the only coverage it's gotten has been his Laracasts video intro, but I recently wrote it up for my book and wanted to share that with you. What follows is an excerpt from Laravel: Up and Running, heavily modified to make sense in a blog format. The Pusher blog has posted the set of tutorials they created as a part of the Laracon EU conference that shows you how to use their service to create a real-time Laravel-based application - a simple chat application. The Laravel framework and Pusher are a great combination. Laravel helps you build elegant applications and at warp speed; Pusher helps you add real-time features to those apps in a fraction of the time it would take to build using your own infrastructure. [...] We recently wrote a set of tutorials covering How to Build Real-Time Laravel Apps with Pusher as part of a Workshop for Laracon EU. We’ve now opened up these tutorials for everybody and anybody to work through. The source has been opened up under the Commons Attribution 4.0 International License so you’re free to fork and adapt to suit your needs or even to run your own workshop. The talk briefly about who the tutorials are targeted at and how the guide is laid out (a Gitbook). It covers some of the fundamentals of Pusher, setting it up via a Laravel bridge, debugging tips and the construction of the actual sample application. On NetTuts.com they've posted a tutorial showing you how to create a real-time chat system using Laravel 5, Modulus and Pusher (with a PostregSQL backend). 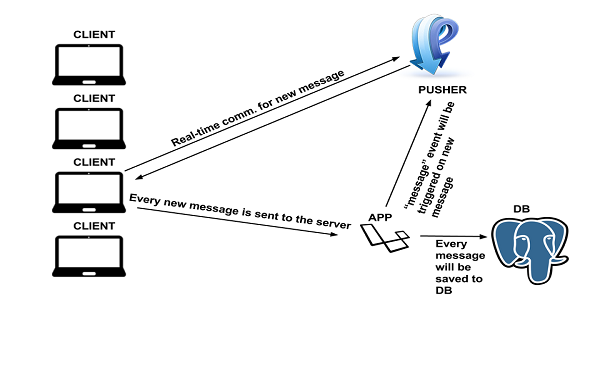 In this tutorial, I will show you how to implement a real-time chat application with Laravel 5, PostgreSQL, and Pusher. Then we will deploy this application to Modulus together. We will use Laravel 5 for the back-end service, HTML5 and jQuery for a simple front-end application, PostgreSQL for the database, and Pusher for real-time communication between the server and clients.